Soft, deep-blue flowers and deeply grooved furry leaves. Bring a touch of the exotic to your patio. Compact and lush, it’s ideal for a patio pot. Delightful, brightest azure-blue to deep-purple blooms smother the whole plant throughout summer. Loved by butterflies and other pollinators. Sent as an established plant in a 2L pot. This lush patio plant will bring a touch of the exotic to your garden this summer! 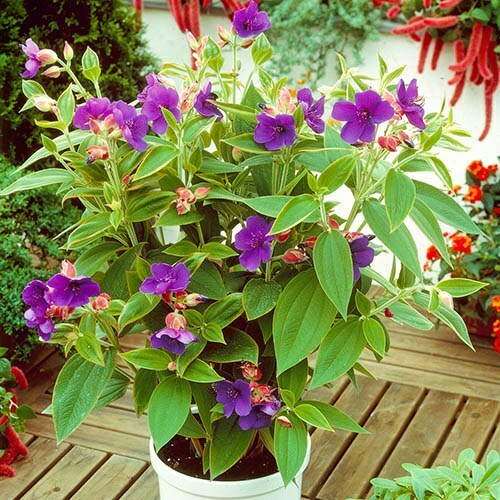 Forming a soft clump of downy foliage that remains compact, the Glory Bush, Tibouchina 'Rich Blue', is ideal for a patio pot or for a cool conservatory. In late-spring, the most delightful, brightest azure-blue to deep-purple blooms smother the whole plant, lasting throughout summer in a wonderfully exotic display. It is not uncommon for the blooms to obscure the deeply veined, furry foliage, there are that many. In addition, the leaves feature three deep veins that run along them, giving the foliage a striking corrugated effect, which further adds to its beauty. A definite wildlife-friendly plant, butterflies and other pollinators will be drawn to the vibrant flowers. Best grown as a patio container plant in the summer and brought into the house over winter as it is not frost hardy. Grow in a good quality. loam-based compost in full light but keep shaded from hot sun. Water freely in summer but keep just moist in winter. Outdoors, grow in moist, fertile, well-drained soil in a frost-free area, bringing under cover if the temperatures fall below 7C.